Why did you make these? Despite bookmarking hundreds of posts and articles on UX, it’s easy to feel like you still haven’t quite grasped UX in its entirety— it’s a big topic! After listening to other UX designers express their desires, frustrations (and titillation), at all the evolving methods in UX it became clear that the industry needed a tool, something to refer to.. Especially when dealing with stakeholders and clients whose understanding of UX, at best, is often fuzzy. UXD Cards help clear up misconceptions, enable rapid learning, and prove invaluable in project planning. They’re portable, interactive, and would make it easier to recall and share essential information on the UX design process. Love the idea, what are the specifications? Why cards? Why not an app? With a significant number of methods, activities and tools involved in UX, making a physical card deck seemed the most logical next step. Unlike an app, cards are shareable, interactive, easily integrated into existing workflows, and bring clarity and productivity to teams and stakeholder workshops without a great deal of effort. We were also very tired of looking at screens. We wanted something that was fun and, most importantly, lead to more confidence in the UX design process regardless of whether they were a UX novice or veteran. A tactile tool made the most sense and the concept was born and refined into what you see today. OK, but will you make an app eventually? Everyone has an app. We’re currently developing for both android and iOS. Stay tuned! Keep in mind though: if you own a copy of the card deck you get the app for free! I’m still quite new to UX, is this of any value to me? Absolutely! These cards were originally designed to assist new UX designers and stakeholder to quickly grasp the key UX concepts. Overtime, we discovered and developed a number of ways to play with cards and extract maximum value. 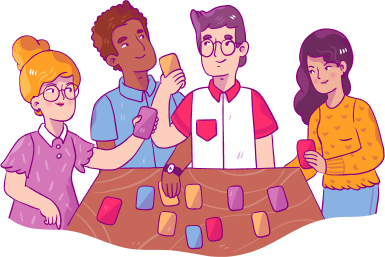 With so many activities, tools, and methods involved in the UX Design process we’ve made sure that you have a crystal clear description on each card as well as a link to a more detailed step-by-step explanation if you need it. Use the cards as a simple reference tool, test yourself and others, or use them in workshops and client meetings to get everyone on the same page. I’m a senior UX Designer, is this of any value to me? Yes! You’ll love them. Particularly if you’ve used ‘home-made’ method cards in the past and found them useful. Thoroughly constructed cards will make your next workshop that much more enjoyable. In fact, we spent a great deal of time working with various UX designers—including senior folks like you—at every level of the process. This included writing and assessing the content, honing the illustrations, gathering community feedback, and redesigning each card based on findings and insights. We did our research and couldn’t find a UXD Card deck that had gone to anywhere near the same lengths to ensure an outstanding product for UX designers, students, teachers, and practitioners. How did you come to this price for a card deck? The cost of designing, printing, shipping, fulfilment, marketing—not to mention the cost of coffee, pizza, and late nights spent in front of the computer—is higher than we had hoped for. But we’ve got a great accountant who assures us that we can make it work and have still enough leftover to continue creating awesome analogue products for designers. Again, your mileage may vary. In some countries, shipping can be as high as $75 USD. If you have been subject to high shipping fees in the past, please ensure that the total cart price at checkout is reflective of your standard shipping fees in your region. If not, please Contact us to arrange alternative delivery methods. Please also take note of local custom and taxes in your region. I want a discount, how do I get one? The easiest way is volume or group purchase which enables discounts when you purchase multiple decks at the same time. Provide us with a glowing testimonial or endorsement. let us know what you said and where you said it. Get us a write up in a major media outlet, blog or publication. Refer 10 or more customers and get your deck free! Limited 1 per company. Be (or work in) a charity, NGO, or not-for-profit and we’ll get a few decks to you at cost price. Make us an offer we can’t refuse— the more creative the better your chances! I love what you’re doing, how can I get more involved? We’re delighted to find people like you, particularly when you do actually make a positive difference. Beyond telling your friends and colleagues, we’d be grateful if you could contribute to the creation of future method cards. You can click on the suggest a card button or visit https://uxdbootcamp.com and suggest a method there as well, don’t worry, we’ll make sure you get full credit for your work. Can I reuse or republish your content? Fluff no! UXD Cards are available under a BY-NC-SA 2.0 Creative Commons license. That means you can use the content but you can’t profit from it and you have to give us full credit. Also, make sure you’re only sharing our stuff through the same channels as ourselves, meaning don’t go and create an app using any of our content or our name “UXD Cards” or “UX Method Cards”— which are in the process of being trademarked. By accessing the website at https://uxdcards.com, you are agreeing to be bound by these terms of service, all applicable laws and regulations, and agree that you are responsible for compliance with any applicable local laws. If you do not agree with any of these terms, you are prohibited from using or accessing this site. The materials contained in this website are protected by applicable copyright and trademark law. This license shall automatically terminate if you violate any of these restrictions and may be terminated by Design DNA at any time. Upon terminating your viewing of these materials or upon the termination of this license, you must destroy any downloaded materials in your possession whether in electronic or printed format. The materials on Design DNA's website are provided on an 'as is' basis. Design DNA makes no warranties, expressed or implied, and hereby disclaims and negates all other warranties including, without limitation, implied warranties or conditions of merchantability, fitness for a particular purpose, or non-infringement of intellectual property or other violation of rights. Further, Design DNA does not warrant or make any representations concerning the accuracy, likely results, or reliability of the use of the materials on its website or otherwise relating to such materials or on any sites linked to this site. In no event shall Design DNA or its suppliers be liable for any damages (including, without limitation, damages for loss of data or profit, or due to business interruption) arising out of the use or inability to use the materials on Design DNA's website, even if Design DNA or a Design DNA authorized representative has been notified orally or in writing of the possibility of such damage. Because some jurisdictions do not allow limitations on implied warranties, or limitations of liability for consequential or incidental damages, these limitations may not apply to you. The materials appearing on Design DNA's website could include technical, typographical, or photographic errors. Design DNA does not warrant that any of the materials on its website are accurate, complete or current. Design DNA may make changes to the materials contained on its website at any time without notice. However Design DNA does not make any commitment to update the materials. Design DNA has not reviewed all of the sites linked to its website and is not responsible for the contents of any such linked site. The inclusion of any link does not imply endorsement by Design DNA of the site. Use of any such linked website is at the user's own risk. Design DNA may revise these terms of service for its website at any time without notice. By using this website you are agreeing to be bound by the then current version of these terms of service.